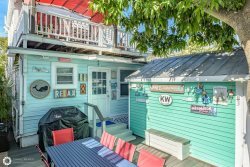 Located at the artsy 1200 block of world famous Duval Street, Mermaid Cove is the ideal affordable getaway for your Key West vacation. You are in the heart of historic Old Town Key West, where an eclectic mix of restaurants, art galleries, beaches, bars, museums, and night life are within walking or biking distance. Out the front door is Banana Café, the perfect place to start your day with a delectable breakfast, or drink a healthy smoothie from the Southernmost Smoothie Shop. Mermaid Cove features four separate units (two cottages and two apartments), each with a private entrance and all decorated and furnished in charming tropical fashion. The units surround a central courtyard with outdoor patio furniture and a large gas BBQ grill. Mermaid Cove allows you to gather as a group, but also have privacy. With accommodations for up to 12 people, it is perfect for extended families, a bunch of friends, or bachelor, bachelorette, and wedding parties. Mermaid Unit 1 is an upstairs unit with a king bed, full kitchen, bath with shower, and living room with full sleeper sofa and a mini-split air conditioner. The living room has a large flat-screen TV/DVD player and French doors that open onto a deck with table and chairs. It sleeps four people. Funky Unit 2 is downstairs with a queen bed, bath with shower, mini kitchen with under-the-counter fridge, microwave, toaster oven, coffee maker, blender, TV/DVD, and a mini-split air conditioner. It sleeps two people. Ocean Cottage 3 is free standing and has a king bed with French doors that open onto the central courtyard. The bath includes a shower. The kitchen has a mini-fridge, microwave, toaster oven, coffee maker, blender, TV/DVD, and a mini-split air conditioner. It sleeps two people. Nautical Cottage 4 is at the rear of the courtyard and features natural cedar walls. At the entrance is a beautiful mosaic tiled 20-foot wall with a one-of-a-kind mural of a Key West beach scene with a Mermaid! This unit features a queen bed and two twin beds, bath with shower, kitchen with a mini-fridge, microwave, toaster oven, coffee maker, blender, flat screen TV/DVD, small sitting area/dining table, and a mini-split air conditioner. It sleeps four people. The courtyard has a large Weber Genesis grill and large outside stainless steel sink that can be used to clean your catch of the day from your fishing excursions.The lights on the patio at night can be casual with the blue rope or blue lamps or you have the ability to turn on a powerful LED light to light up the entire patio.The courtyard also has a Mermaid bottle opener and a weathered bell to get everyone's attention for a special toast or occasion. Beware of the shark in the Mango tree and you may occasionally get a visit from "DINO," the large iguana absorbing up some rays. Note: Parking in Key West is very limited. This property has no assigned parking and is street parking only. You are responsible for finding parking for your vehicle. The maximum people allowed in this property is 12. If there are more than 12 people are in your party upon arrival, your party will be asked to leave without compensation. Sleeping Arrangements: Sleeps up to 12! Unit 4: Queen bed and two twin beds. Great decision! We were in Key West for the wedding of one of my children. (The newlyweds had their own place.) My other three children, their spouses and children and my husband and I stayed at Mermaid Cove. It worked perfectly for us! The enclosed courtyard was wonderful for little kids as they were essentially "locked in" and we didn't have to constantly corral them. Each family had their own space, yet we could gather as a group when need be! We did have an AC issue the first night, but it was remedied before bed the next night. They are very prompt in taking care of problems. Having a washer and dryer onsite was extremely handy as well. There was a new establishment next door that had installed security lights that did not shut off. I simply called them each night and they turned them off for us. I know the Key West Hideaways property manager was working on the situation when we left. Definitely a wonderful setting for a large group. Location was fantastic! Wedding was wonderful :-) I would definitely consider staying here again! Note: Parking in Key West is very limited. This property has no assigned parking and is street parking only. You are responsible for finding parking for your vehicle. Individual making the reservation must be 25 years or older with proper identification and be an occupant of the property. The maximum people allowed in this property is 12. If there are more than 12 people are in your party upon arrival, your party will be asked to leave without compensation. Violation of ANY house rules will result in your party being asked to leave without compensation.